Lock in a great price for Astra Suites - rated 9.8 by recent guests. The staff were amazing, particularly Eleni and Theodore who kept me appraised before my arrival of the status of the Greek ferry cancellations which delayed my arrival by a day. We had a delicious dinner in the restaurant and the restaurant staff were also very helpful. We loved our stay at Astra Suites, especially our youngest daughter who chose it as her favourite spot from our 8 week trip! The pool is the highlight and the perfect spot to watch the sunsets from. Highly recommend staying here. If I could give Astra 11 stars I would. We absolutely loved everything about our stay here. It is set in a quiet part of Imerovogli that has the atmosphere of a secluded, but not isolated, beach town (think quiet breeze and muted sounds). 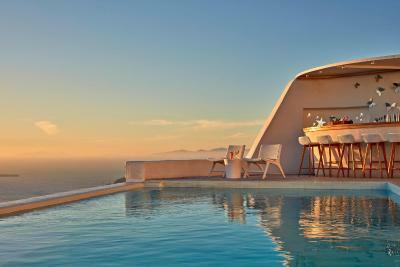 We loved the privacy and peacefulness of the pool terrace with its relaxing music, contemporary decor and stunning view. We felt like we were in a meditation retreat. 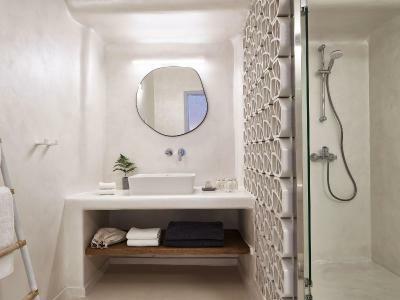 All the amenities are at hand and the staff, who really make this place special, are there to make your stay as simple and worry-free as possible. They were very affable and accommodating, helping to arrange everything from restaurant reservations to transportation, and tours. Upon arrival they mapped out the sights near and far, giving us walking distances, restaurant recommendations and what times of day were best for different activities. I didn’t have to research a thing! I think we really lucked out in finding Astra, we’ll definitely be staying there again next time. The staff...nothing is too much trouble. The smallest request is dealt with immediately. The views from the suites, swimming pool and restaurant. The quality is first class throughout. The cocktails! As soon as we arrived we were made to feel extremely welcome and comfortable. The staff did everything to make our stay perfect which it was. The hotel is absolutely stunning, the swimming pool is amazing, the bar is great, the food is exceptional and the rooms were perfect. It really was a magical experience and we will be returning as soon as we can. Built on the cliffs of the Caldera in Imerovigli, Astra Suites features a wellness centre and an infinity pool with sun-lounger terrace. 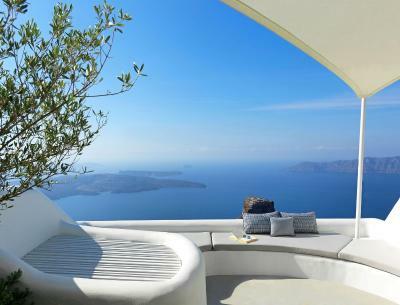 All suites have verandas with a spectacular view of the caldera, the Aegean Sea and the sunset. 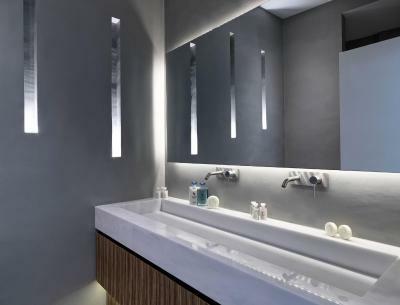 Featuring works of art, candles and ornaments on every available surface, the suites consist of a bedroom, kitchen and a lounge area with sofa. 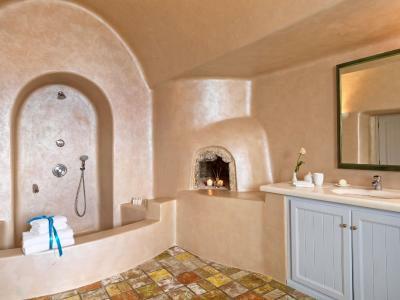 Several have their own spa bath or private pool. Astra Suites serves an a la carte breakfast on your balcony or by the pool. Creative Greek and Mediterranean cuisine is served at the on-site Astra Suites gourmet restaurant. Private dinners can also be organized upon request. 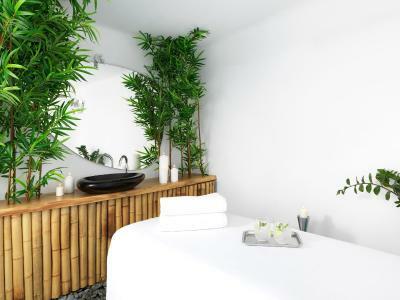 The hotel's facilities feature a hot tub, steam room and massage area. Beach and pool towels are free of charge. There is wired and wireless internet connections, and you can borrow a laptop from reception. The hotel reception can arrange sailing tours, excursions and transfers. Staff will be happy to assist you with area info and suggestions on what to do on the island of Santorini. 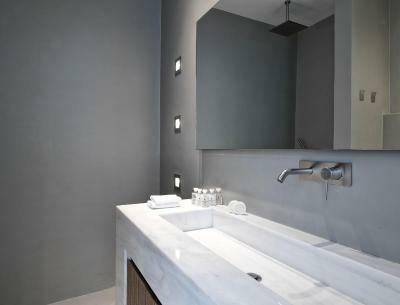 Astra Suites is 1.2 miles away from Fira, 5 miles from Santorini Airport and 6.2 miles from the port. Guests of the Astra can park their cars at the nearby municipal parking lot. Astra Suites has been welcoming Booking.com guests since 15 Nov 2010. 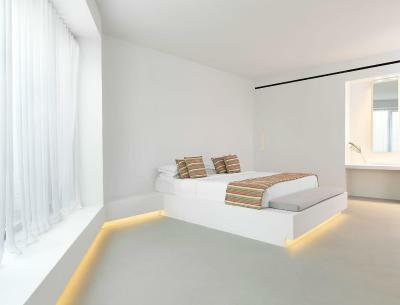 When would you like to stay at Astra Suites? 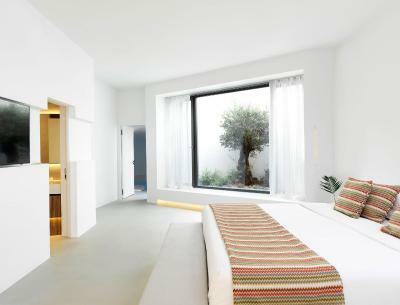 Opening to a terrace overlooking the Caldera, the volcano and the Aegean Sea, this open-plan studio features a living room, a bedroom with double bed, a kitchenette and a bathroom with shower. Most of the units are located on the ground floor, just off the main terrace area. Please note that the outdoor terrace is on the ground floor or next to the main stairs. Although it is private, it is not secluded and may be visible to other guests passing by. 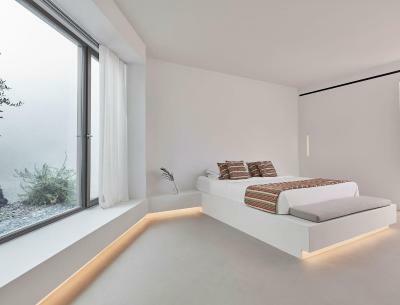 Opening to a terrace overlooking the Caldera, the Aegean Sea and the sunset, this junior suite has a living room, a bedroom area with double bed, a kitchenette and a bathroom with shower. These ground-floor units are situated just off the main hotel terrace and also overlook the stunning pool area. The outdoor terrace is on the ground floor, at swimming pool level. Although it is private, it is not secluded and may be visible to other guests passing by. 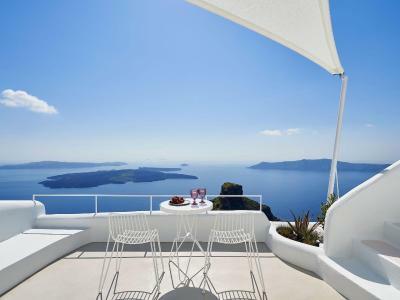 Opening to a private balcony overlooking the Caldera, the Aegean Sea and the sunset, this senior suite has a spacious living room, a bedroom area with double bed, a bathroom with shower and a kitchenette. 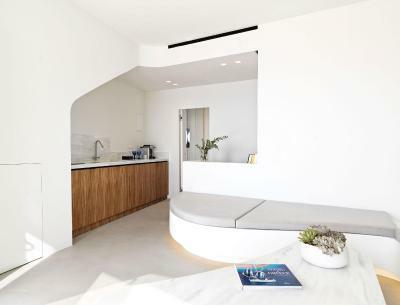 The outdoor terrace is located on a higher floor so it offers a higher degree of privacy. Some of these suites may accommodate up to 3 guests (1 guest will be accommodated at the built-in sofa bed). Some units are open plan. 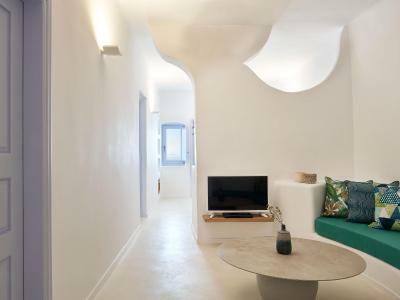 Opening to a spacious balcony or terrace overlooking the Caldera, the volcano and the Aegean Sea, this family, cave-style suite has 2 bedrooms with en-suite bathrooms, a spacious living room, entertainment system and a fully equipped kitchenette. It is located on the ground floor and can accommodate up to 4 guests. The outdoor terrace is on the ground floor. Although it is private, it is not secluded and may be visible to other guests passing by. 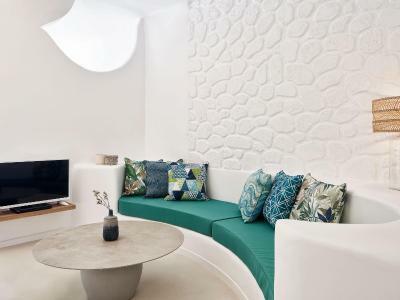 Opening to a private balcony overlooking the volcano, Aegean sea and sunset, this superior suite has a spacious living room with local art, a bedroom with king-size bed, a bathroom with shower and a kitchenette. Some units offer romantic, in-bedroom showers. 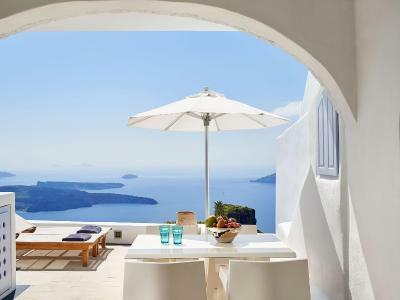 Boasting a panoramic terrace with an outdoor jetted tub for two and views over the Caldera, the Aegean sea and the sunset, this honeymoon suite has a living room with works of art, a bedroom with king-size bed, a spacious bathroom with shower, and a kitchenette. A dressing area is also included. The outdoor terrace is located on various levels of the property, so it offers a higher degree of privacy. Please note that some units can accommodate an extra guest at the built-in sofa, on request. 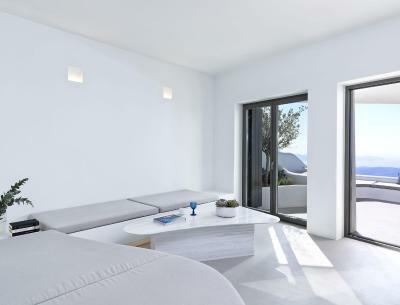 Boasting a private panoramic terrace with heated pool and views over the Caldera, the Aegean Sea and the sunset, this suite has a spacious living room with works of art, a bedroom with king size bed, a spacious bathroom with shower and a kitchenette. A dressing area is also included. Please note that the private pool is heated only during the low and middle season. 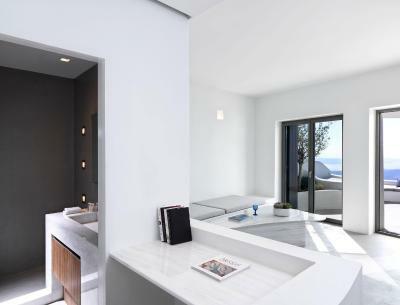 Located approximately 500 metres from Astra Suites Hotel Complex, Astra Private Villa features unobstructed Caldera views, a private swimming pool and outdoor hot tub. 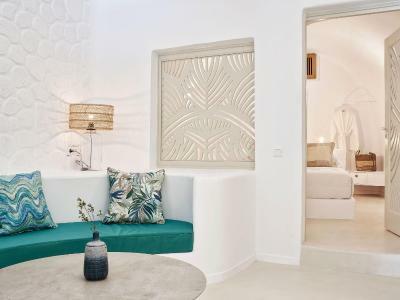 The two-bedroom, air-conditioned villa of 180 square metres includes 2 king-size beds, one of which converts into 2 twins if needed, 2 en-suite bathrooms and a third guest bathroom, all fitted with luxurious toiletries and hairdryers. -Safety deposit box, satellite TV and iPad/laptop. -Photographer and private party/ functions planning. Please note that the low-season months the private swimming pool can be heated. 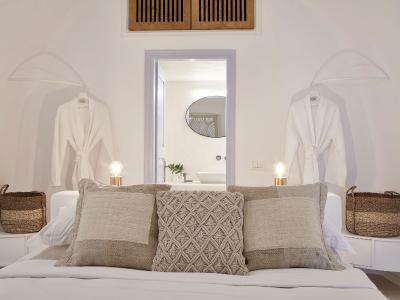 Opening to a private terrace with views over the Caldera, the Aegean Sea and the sunset, this junior suite has a living room, a bedroom area with double bed, a bathroom with shower and a kitchenette. This ground-floor unit is situated just off the main hotel terrace and also overlook the stunning pool area. 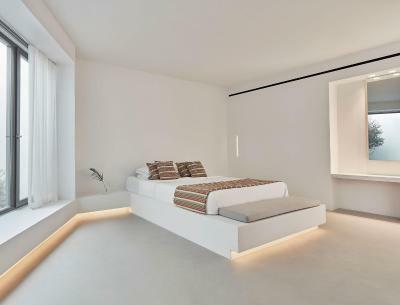 Please note that 1 extra guest can be accommodated at the built-in sofa bed, on request. 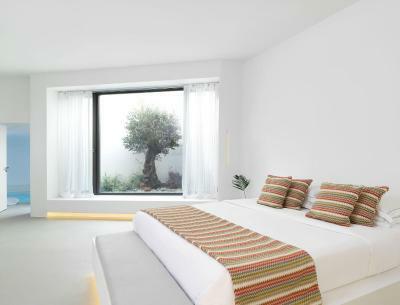 This suite boasts a panoramic terrace with infinity heated pool and views over the Caldera, the Aegean Sea and the sunset. 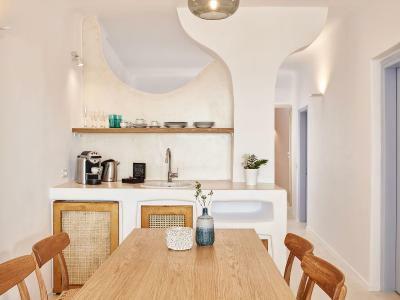 It features a spacious living room area with local works of art, a bedroom with king size bed, a spacious bathroom with shower, and a kitchenette. A dressing area is also included. 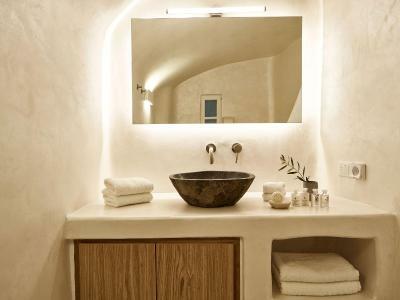 Boasting an indoor, cave pool, this deluxe suite opens to a spacious terrace with panoramic views over the Caldera, the Aegean Sea and the sunset. It features a bedroom with king-size bed and sofa bed, a spacious living area with a kitchenette, and 2 bathrooms with shower. Please note that the indoor pool is heated only during the low and middle season. 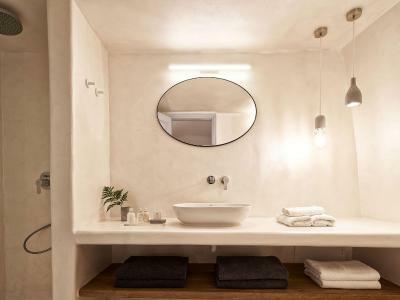 House rules Astra Suites takes special requests - add in the next step! Astra Suites accepts these cards and reserves the right to temporarily hold an amount prior to arrival. Please note that the infinity pool is heated during low season. Kindly note that children can only be accommodated in specific room types, due to safety reasons. Guests traveling with children are kindly requested to contact the property. Please inform Astra Suites in advance of your expected arrival time. You can use the Special Requests box when booking, or contact the property directly with the contact details provided in your confirmation. We didn’t know which direction on the faucet was hot or cold and if you made the mistake of going to hot it literally would burn you. It also took a while to figure out how to lock the door to the suite. Also there is a water flow that goes down the steps around 5pm Which made going down the stairs absolutely dangerous. It was scary! It was clean and comfortable. Nicely furnished with a large bathroom. Lots of steps which are slippery when raining. Very loud banging noises at night that seemed to come from vent. The design of the room. Friendly and attentive staff. Views from the room. Cleanliness. Breakfast. We booked the family suite. The room was spacious and comfortable. It comes with a jacuzzi on the front patio which we enjoyed. The staff was very attentive and always pleasant. The views from our front porch were incredible. We were sad to leave. We highly recommend this resort. A place where the actual views are better than any professional ones and the quiet of the surrounding bays lifts the spirit. Our superior family apartment was beautifully furnished, very large, private, immaculately clean, beds were incredibly comfortable. 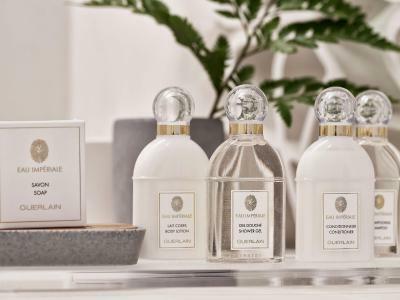 We appreciated the lovely Guerlain toiletries and the evening chocolates. Customer service at this small boutique hotel was outstanding; reception, personal breakfast, room service dinners, twice daily room service, pool bar - all excellent! This is not a budget hotel, we are so grateful we were able to indulge ourselves these holidays and Astra did not fail to deliver the perfect backdrop to a much needed family holiday, thank you Astra Suites. Difficult to think of anything specific as no real negatives. Staff were all awesome! Christine was always ready to help and always had that “what can we do for you” attitude. Stop your search! It doesn’t get any better then Astra! The entire experience was like a dream. The staff was the kindest and most accommodating I have ever experienced. They took the time to get to know us and our daughter, and we were able to form a relationship with the staff over the 5 days. This had us leaving feeling like friends rather than strangers. Also, we loved the breakfast on our terrace each morning. It was such a beautiful and relaxing way to greet the day. I can't wait to come back. The north wind can be strong at times, but the pool is nicely heated, just remember to keep a towel nearby! Astra far exceeded our expectations. The hotel is the most beautiful place to stay with the most amazing views. Even better than the views were the staff. The staff at Astra is absolutely stellar. 5-star luxury service at its finest. 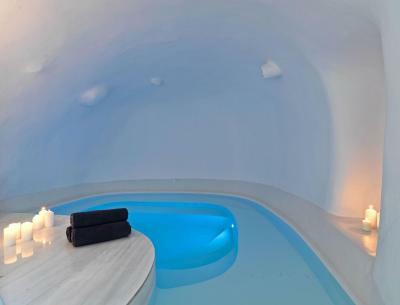 I’d highly recommend this to anyone who travels to Santorini. We visited all the towns and this by far has the best views, the best service and the best staff. Can’t wait to return!